Lord Nataraja's favorite devotee - Alan! 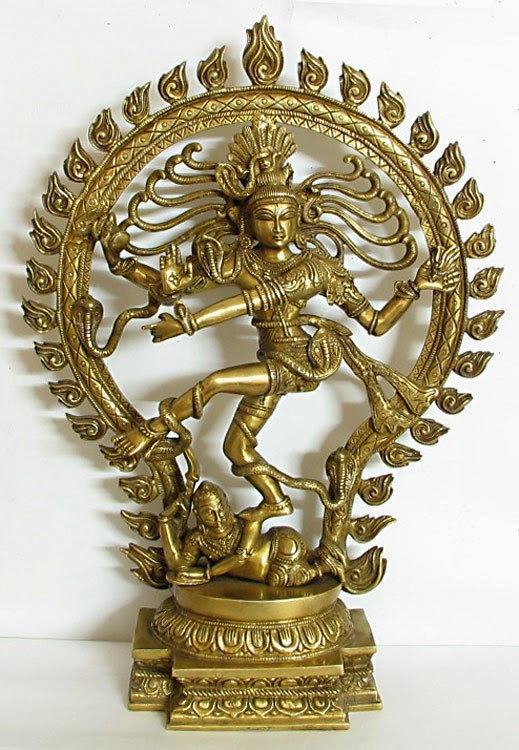 Lord Nataraja is one of the most famous forms of the Supreme Lord. He is one of the beloved forms of Lord Shiva, in the form of the dancer. He is considered the most Gracious, Beautiful and with a form very endearing to His devotees. The Glory of the Lord is best sung by His devotees - Vishnu Sahasranama is considered more sacred than Bhagawat Gita because the Lord listened to His glory from Lord Bhishma, while the Gita was told by Lord to Arjuna. A true devotee of the Lord brings out the nature of Lord, His Grace, Glory and mysterious ways of work much more than philosophical ramblings of any intellectual. I have been focussing too much on my career, for the past many years - Money, fame were never the key motivators for me, but like all adventure seekers, I seek challenges and solving tough ones brings me a sense of satisfaction like no other aspects of life. In this, I miss connecting to the spiritual core, which I used to connect so often. I have been yearning to spend some time in spiritually active places for a while now. So, when my brother-in-law, Deepak told me that the Maha Kumbhabishekam (sacred re-consectration) of the Chidambaram Temple, which houses Lord Nataraja was to be held on May 01, 2015, I jumped with joy (although only figuratively) and I decided to join him in Chidambaram. When I started, little did I know that I'll get an opportunity to see Alan, a person so dear to Lord Nataraja that He called him from Australia! 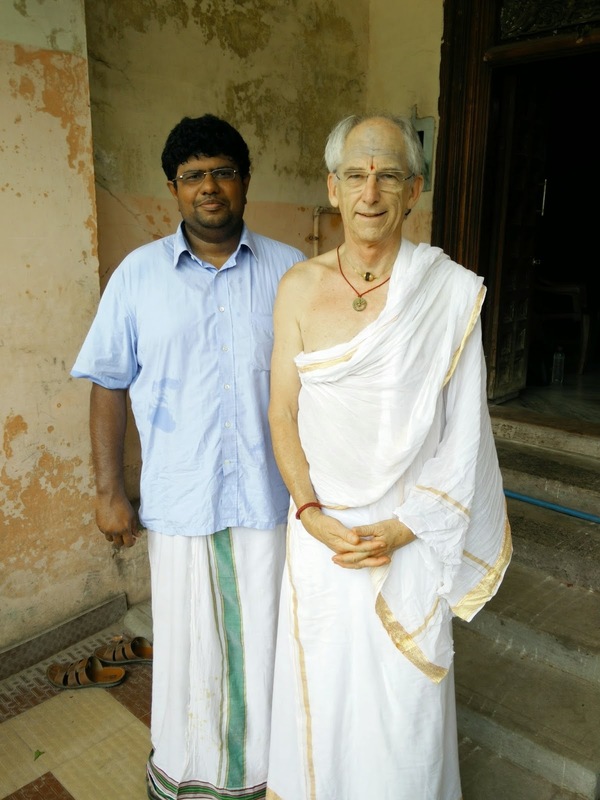 I was very curious to see a foreigner wearing Rudraksham around his neck, along with a small pendant of Lord Nataraja and I started talking to him, and what I learnt blew my mind! Alan Croker, is an architect, and he lives in Australia. When he was around 21 years of age, he got an experience where he saw everything as One - As Vedas proclaim, 'Ekam eva Adwitiyam' (There is only non-divisible One) - Alan lost consciousness after this grand experience. He was completely transformed after this experience. The yearning to find what happened increased and His quest for Truth started. God, is often referred to as Truth in Hinduism. Lord Shiva, is popularly attributed as Truth, Most Auspicious and (infinitely) Beautiful (Satyam, Shivam and Sundaram). Srimad Bhagawatam, by Sage Veda Vyasa opens as 'I bow to the Lord who is the ultimate Truth' (Satyam Param Dheemahi). Ways of the Lord are mysterious - As an architect, Alan got interested in temple architecture. He planned a trip to India to understand temple architecture and to see 'what is the core of the structure' as he put it. The core of the temple is not just the architecture or the construction material or the way it is built, but some infinite power that makes temple, a temple. He came to India in 1986 in December and visited a few temples. He could feel the power in temples, but still, the 'connect' was waiting to happen! I see similarity to Paul Brunton searching for His Guru, and the great Kanchi Sankaracharya, Sri Chandrashekarendra Saraswati guiding him to go to Bhagawan Sri Ramana Maharshi. Once Brunton reached Ramana, his wanderlust stopped, for he reached his final destination. On the Christmas day of Dec 25, 1986 little did Alan know he was going to connect with the Lord of the entire Universe, the Lord of Lords, the immaculate, peerless and unparalleled, Sri Nataraja! Alan was a Christian, and when he entered the temple and saw the Sanctum Sanctorum (Garbha Gruham), Alan did not see the idol. What he saw was blinding light inside and needless to say, Alan's inner search ended. Brahma sutra starts 'Athaatho Brahma Jignasa' - From then the yearning for Brahman starts. For Alan, the search ended in Chidambaram, when Lord out of His infinite mercy pulled Alan from across the globe, thousands of miles away, hugged him and took him back. Addition: What Alan saw in his own words - "When I first entered the sanctum at Chidambaram, it was not the formless energy alone I experienced, but the form that arises directly from it - His Form, Lord Nataraja, and the two are only One. I had been searching for many years for His form. He brought me to Chidambaram to find him. I also knew at that time that He takes the form that is appropriate for each of us, and each is different. For reasons that I still do not understand, this dancing form of Lord Shiva is His form for me. I know this is the form of the final doorway for me to the formless Absolute. Others may have different doorways / forms / paths, and we are very fortunate if we can find our own in this lifetime. " Vedantins say no experience is final and the Jnana is ultimate. For Alan, I believe Lord Nataraja is the Guru and He takes care of him more than any Guru without the constraints that one in human form has. I was completely moved, humbled and at the same time overjoyed to hear this from Alan. I was staying in the house of Sri Parameshwar Aiyya Deekshitar (under whom my Brother In Law learnt Vedas). He is one of the Chief Deekshitars in Chidambaram (and was one of the two people who led the Kumbhabhishekam efforts this year and he was the one who performed Kumbhabishekam in 1987). It was His Guru, Sri Srividyananda Natha who did Kumbhabishekam in 1955. No words can describe the glory of Sri Parameshwara Aiyya. He is a living saint, whose only focus in life is to serve Lord Nataraja and has many many illustrious disciples. It was so heartening to see the entire family and students of Aiyya and Aiyya himself so happy to see Alan. Who can appreciate the devotees of Lord Nataraja than the Deekshitars, who descended from Heavens to earth to worship Lord Nataraja when His temple was established in earth by Sri Patanjali and Sri Vyagrapathar. Lord gets His glory when sung by His devotees. Sri Arunachaleshwarar sent Ramana to sing about Him. I believe Alan's experience is very special. I asked Alan if I can share his experience with other devotees through my blog. He said please do, and said that was because, he wants everyone to know the Lord is not just an idol. He is very much alive and in action to take back His devotees. Another key trait I noticed about Alan is that he could talk freely only as long as he or I did not mention Lord Nataraja. The moment he mentioned the Lord's name or if I mentioned he completely chokes and tears drop from His eyes. This happened not the just first time he mentioned, but EVERYTIME he or I mentioned the name of Lord Nataraja. I could understand the gratitude of the soul on receiving His Grace. In Kandhar Anubhuti verse #1, Invocation to Lord Ganapathi, Sri Arunagiri Nathar says, let this poem melt the hearts of all devotees, even those who have a stone cold heart. When the heart melts, it is seen externally from the tears that pour through the eyes. I feel completely blessed to have seen and interacted with Sri Alan in Chidambaram. In these times where materialism is rampant, and people enter into transactional relationship with God, and convert to other faiths for money, and sometimes when I despair that Hinduism is on the wane, this incident is a reinforces my faith that (only) Truth always triumphs (Satyam eva Jayate) as proclaimed by Mundaka Upanishad. I never do this, but I request you to share the story of Alan with as much devotees of the Lord as possible. Let the world know that God pulled his devotee from thousands of miles away to His fold, and with Grace, we can reach His feet too. Alan still lives in Australia and makes frequent trips to Chidamabaram. Alan, thanks for sharing your experiences - You are very dear to Lord Nataraja, and I feel blessed to have met God's favorite devotee. Addition: Alan's comment on my previous statement - "When I come to Chidambaram, I am with a large family of Shiva bhaktas who come together to celebrate Him. Some are fortunate to directly serve Him, some live locally while others like myself have to travel some distance - but we are all the same. He brings us all together. We are all lovers / bhaktas of Him and we know each other and recognise each other through Him. "